Riding a bicycle is not only fun, it’s an excellent form of aerobic exercise. A regular routine of cycling will get you in shape and keep you that way. You can achieve cardiovascular fitness, improved heart health and improved muscle strength and tone. Of course, once you do the work to get fit, you should cycle enough to stay in shape. 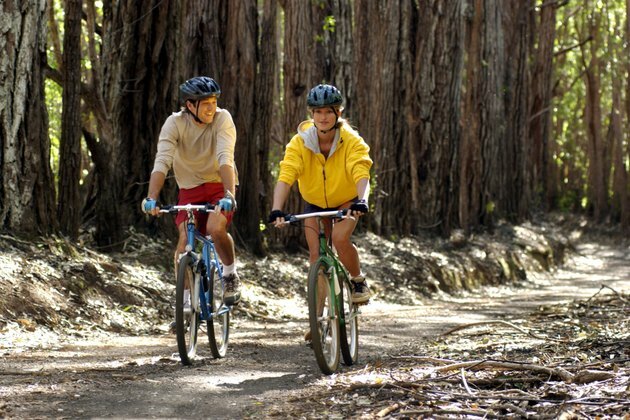 Whether you choose cycling or some other activity, MayoClinic.com recommends that you need at least 2 1/2 hours of aerobic exercise each week to achieve and maintain good physical fitness. Adding strength-training twice a week is also recommended. You can do your cycling outdoors or use a stationary bicycle at home or at a gym. When you go cycling, you should ride vigorously enough to raise your heart rate to a level that builds cardiovascular fitness. The most accurate gauge of your exercise intensity is your heart rate. When you start out, a heart rate of 40 percent to 50 percent of your maximum heart rate. Over time, you need to work up to a heart rate close to 70 percent of your MHR. Once you are in shape, ride fast enough to maintain that heart rate. For many people, staying in shape means keeping the extra weight they have lost from returning. Cycling burns a lot of calories and so helps control weight. Counting the calories you burn cycling along with those you eat is a useful way to stay on track. The calories you burn cycling depends on your weight, how fast you ride and how long you ride. For example, if you weigh 130 lbs., you burn about 354 calories an hour riding 10 to 11.9 mph. A 180-pound person will burn 490 calories per hour at that cycling speed. At 14 to 15.9 mph and a weight of 130 lbs., you burn 590 calories and a 180 lb. rider burns 817 calories per hour. For weight management, how much you should cycle every day depends on how many calories you want to burn each week. Part of staying in shape is keeping the risk of injury to a minimum. Cycling strengthens leg muscles and your cardiovascular system, but provides only limited exercise for your upper body. You can achieve better physical fitness and lower the chances of injury with upper body strength-training. It is also important to ride with your back arched and with good form. Your bike should be the proper size and adjusted to your height and body proportions. That way, you minimize stress and reduce the chances of an injury. Does Cycling Help You Lose Weight in Your Waist & Thighs?